This article will strike at the heart of some long-cherished beliefs and upend some wrong theology in the church. The only way to correct these ideas is with the clear teaching of God’s Word. So, here we go! “They (people)have set up kings, but not by Me (the Lord): they have made princes, and I knew it not”(Hosea 8:4a NASB- parenthesis are from me to clarify). People put some kings and princes in power without following God’s will or plan! What a shocking and controversial statement! Can government officials be set in place by people and not by God's direction or authority? The answer is, “Yes,” according to the Word of the Lord through the prophet Hosea. God did not put all leaders in authority. There are kings, prime ministers, and presidents that God had nothing to do with their election, and in fact, people put them into that position of authority. God had NOTHING to do with many leaders being elected. That is a shocker to many traditional beliefs, but there it is in Hosea. Believe it! 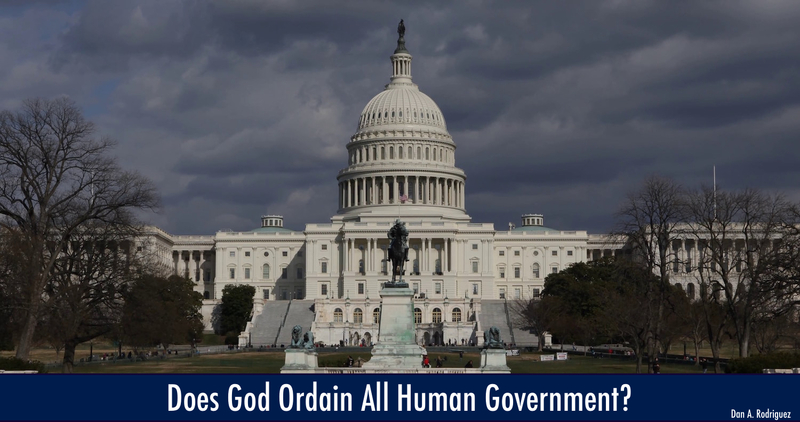 Many believe that God ordained all government to rule over mankind. Everybody points to Romans 13 as his or her theological position on governmental authority as ordained of God. Some believe that we should always submit to government authorities even if they are evil. We will look at that passage in part 2 of this series. The interpretation many have given Romans 13:1-7 is in opposition to many scriptures in the Bible. Hosea 8:4 is just one of them. The government may be an institution in and of itself, but those that govern within it define the government. Bad leaders make the government bad, and good leaders make the government good. The institution of government has no life of its own. That is why we must work to get good elected officials into our American government. It is not the form of government as much as it is who is charge! Some have the belief that God institutes a particular form of government, but there are many varieties of government. There are democracies, republics, democratic republics, aristocracies, dictatorships, monarchies, socialist republics, communist states, theocracies, and numerous other types of governments. In the Bible, we usually see monarchies. Today, we see other forms of government. In the West, we tend to think that democracy is the greatest. Actually, democracy is very bad IF you have perverted leaders. What type of government would God approve? Democracy? Republic? Monarchy? Theocracy? Socialist Republic? The answer is simple. The type of government approved by God is that government where His principles, commandments, ordinances, and instructions reign supreme, and all others are weeded out and discarded. All others are on shaky ground with Him. In the Scriptures, we see good and bad monarchies in First and Second Kings and Chronicles. They were always defined by their leadership and not by the “form” of government. Those that followed God found His favor. Evil monarchies were considered damnable because they led the people into idolatry (false religion) and abominable practices such as harlotry, adultery, homosexuality, theft, and many other violations of God’s commandments. Read THE Book! The leaders make the government good or bad according to what they do and how they lead the people.Good leaders would lead the people towards God, and evil leaders would lead the people away from God. Again, a government administers life or death according to its leaders. Does that interest you? You don't want to miss the study on Romans 13:1-7, 1 Timothy 2:1-4, Proverbs 21:1, and other misunderstood verses in this document. This is a five part, 23-page series on one free PDF, and you can download it below.